Q: Why are admins only able to see Leadfeeder visit details in our Salesforce? The rest of my team cannot view the visit details. A: What might have happened is that when someone on your team installed the Leadfeeder package into your Salesforce organization that person clicked on the option to only allow it for admins. STEP 1: Your Salesforce admin should uninstall the Leadfeeder package from your Salesforce. This will delete all of Leadfeeder’s custom entities and any customizations made on top of it. 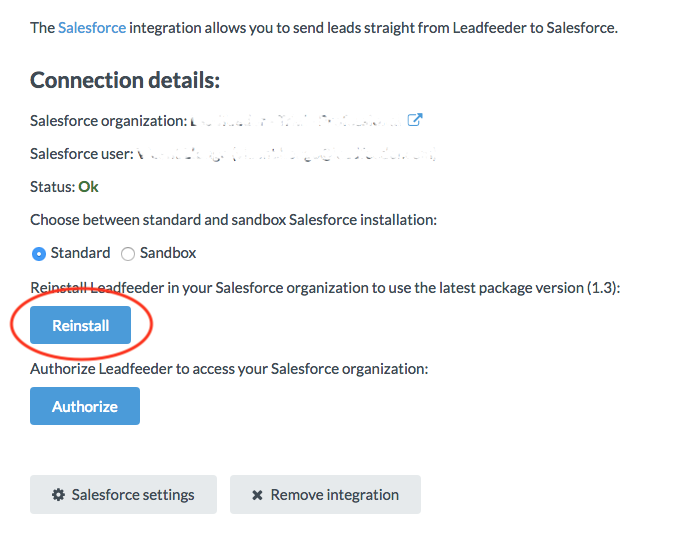 STEP 2: Reinstall the Salesforce package from the Leadfeeder integration page; make sure Install for All Users or Install for Specific Profiles is chosen. STEP 3: Read this Salesforce support article and act accordingly. We suggest the option to create custom permissions set and then assign that set to any number of users.